Then we got to the meeting site–which, it happens, is a Panera. I ordered coffee and a pastry, and I pulled out my battered little IPad and typed, sipping lovely fresh-brewed dark roast at a corner table. The writers, meanwhile, went off to talk writing. When a friendly Panera guy walked by, I asked about their refill policy; he assured me, cheerfully, that as long as I was using my Panera-issued cup I could refill 800 times if I wanted. Eyes gleaming–you gotta love a place with a policy like that–I took him at his word. Clearly I am out of practice. Jazzed up, caffeinated, I trundle out of bed and head downstairs to put this wide-awake time to some sort of practical use. Oh, I’ve come a long wimpy way since childhood, when two cups of coffee just before bed was commonplace. I grew up in Clan MacCaffeine, and I have never fully left it. The smell of coffee and the sound of coffee perking are among my earliest morning memories. My mother, mostly a stay at home mom, got up early and started brewing coffee before the sun rose. She would heat a prepared pot from the night before and drink it, companionably, with my father; then, while he got ready for work, she would brew another pot for his lunch box. That coffee, liberally laced with milk and sugar, went into a huge red plaid thermos bottle. Mom would usher my father out the door, handing him his metal lunch box and the thermos, sending him off with a kiss and a squeeze. Then she put another pot on the stove, brewed it to accompany her morning prayers. She would sit with coffee and an ashtray and her prayer paperwork–books of prayers, an old missal, readings about saints, and lists of people to pray for. She would smoke and sip coffee and spend some quiet morning time having a breakfast cuppa with the Maker. My mother brewed the coffee in a battered old stove top percolator, which saw use throughout the day. To hear the coffee perking, just like the sound from that old TV commercial–Doppa doppa DOP dop!–was to be reassured that life was under control. Whatever else this day might throw at me, I knew there was coffee, fresh hot coffee, brewing on the kitchen stove. When I walked in, after school, coffee was perking. There was always, of course, an after supper pot. And every night, just before bed, my mother would brew a fresh pot to have ready for the morning–but, nightly, without fail, it smelled so good, that she and my father and whichever of the children had reached the Age of Coffee would grab thick white mugs and drink a cup. Then another pot–a pot for the morning for real–would go on to brew, and then the family would go to bed. No one ever seemed to have a problem sleeping. Much later, in college psychology class, I read about caffeine being used to push hyperactive kids over the threshold of manic activity and into some sort of calmer state, and I thought of my parents, my brothers, and me, self-medicating with percolated Maxwell House. I started drinking coffee in earnest when I was thirteen and pudgy. I wanted to lose weight; I had read that black coffee filled you up and added no calories. It also gave me more energy, which helped me to exercise more. I liked it. The weight came off. I started high school eighty pounds lighter than I had been in eighth grade. I was, by then, also a confirmed black coffee drinker; I drink it that way to this very day. Sometime in those heady years, the percolator got traded in for an electric drip coffee maker; Folgers hit the local market and became my parents’ go-to brand. Through the seventies–through the days when I vied [amongst wicked competition] for the title of Party Queen, always a strong runner up, and determined to try, try again,–coffee was my lifeline, the brew that got me re-energized after three hours sleep. That phase, fortunately, did not last out my twenties, and then coffee became the fuel that fired long marathons of weekend paper grading and class prep. I started making, for a while, a half-caff blend that Maxwell House marketed; I drank it all day long, and it seemed to me, in its diminished caffeination, sort of like a health food. We drank coffee when the Knuckleheads got together once a month for rambling pinochle sessions lasting until the wee hours. Birthday parties and family get-togethers revolved around the coffee maker, never allowed to cool or rest. I bought a lot of eight dollar coffee makers and literally burned right through them–I remember, once, my landlord David running across to rescue me, sprinting out of my apartment gingerly tossing a flaming coffee maker from hand to hand. Back to the drugstore, where a GE model was on sale, I went. Somewhere in those days, a friend introduced me to the concept of fair trade coffee, and I read a little about the coffee business, and I became concerned and proactive. I started buying only fairly traded beans, and in the process, discovered a whole new taste in coffee. Dark roast–that was my brew; preferably Italian, but French was good too. And no more buying coffee in a can. The boyos bought me my first coffee grinder. At night I would grind the beans and get the coffee ready–filtered water and all–for an early morning brew. Mark, up first and not a coffee drinker himself, would shower and run downstairs to turn the coffee on and welcome me to the waking world with a lovely hot pot of fresh-brewed dark roast. Along the line, another revelation. Our friend Sharon worked, at the height of the coffee shop craze, at an infamously funky little place in Buffalo, New York, and she came to speak coffee fluidly and intimately. One year she visited to celebrate my birthday and brought me a French press. After a lovely supper, she expertly ground the beans, put them in the press, swirled in boiling water with a wooden spoon. I was dubious–would this be a beefed up version of that anathema, instant coffee? Ignorant, I was about to be initiated. Sharon let the stirred brew steep for three minutes, then slowly, slowly, pushed down the sieve. The smell was incredible. She served me a steaming mug with a smiling flourish; we sipped, and I was hooked. The brew tasted like smoke; the rich coffee flavor–ah, it was right there. You can French press a pot, Sharon suggested, for a treat. With a special nosh. When you just need to pamper yourself. And to this day, although Mark still turns the electric drip pot on every morning, I use the French press on snowy Sunday afternoons or when coffee-drinking company shares dessert. For a long time, my coffee drinking shrank to just early mornings, and I lost the habit of all-day consumption. But just lately, I’ve been involved in offering professional development–which always cries for coffee–, and I have moved my office to a building that offers a Keurig. (When my office began offering more and more professional development events, I allocated some funds in my tightly squeezed budget to buy my own K-cup brewer. The fiscal officer called me into her office and asked me about the request. “It’s….a coffee maker,” I said, and I explained that a participant could make a cup of whatever her favorite drink is; she isn’t constrained to one choice. She looked at me puzzled, and I wandered all around the topic, trying to explain. Finally, I asked, “Do you…speak coffee?” She confessed she did not. How lucky that I had the chance to move to the land of K-Cups. I keep a hidden stash of French roast pods for days when moral stamina is needed. But still. I am a caffeine wussy compared to the championship days when I sipped a steaming brew for most of my waking hours. When I try–oh, it tastes so good, but my eyelids refuse to close, my leg starts to jiggle, and I find myself, like now, awake and typing at…let’s see: 3:45 AM. I know there are those who don’t drink coffee–in fact, I married outside of the Clan. Mark, he likes him a strong steeped cup of tea in the morning, but I’ve never known him to quaff coffee. He loves, though, that good morning smell. And I have colleagues and dear ones who’ve gone over to the decaff side; I suspect they are healthier and less stressed, and probably, on the whole, a great deal more balanced than I. But, my friends…I do not care. I have peeled away my vices: I may indulge in a glass of wine or a bottle of beer a scant once or twice a year. And I haven’t had a cigarette in, oh, sixty pounds or so. We limit red meat. We’re sparing with salt. But the wakeful hours of a dark Thursday morning are a small and occasional price to pay for the enjoyment, the energy, the elixir, of dark roast, brewed to perfection. I am a member of the Clan MacCaffeine; it’s a lifelong membership and a proud one. And, as with any good clan, belonging to this one comes with rules. I have pledged to honor the bean. And I have pledged to share it. So, please know this…if you are ever wandering by my house, and the need for caffeine strikes you, I will take you in and set you up. I will press a pot of coffee; I will set a steaming mug before you. I will offer cream and sugar; I will pluck a silver spoon from the ‘company’s coming’ drawer. And I will keep you company. I will peer at you through the fragrant steam, and I will ask you what brought you to walk down the quiet streets of my neighborhood, and I will listen close to your reply. I will savor that talk, and I will savor the dark, bold brew we share. I’m of the Clan MacCaffeine. This, dear one, is what we do. It’s nice to feel like I’m sharing a morning cuppa even virtually with good blogging comrades like you! Some day, Jodi, we’ll share a steaming mug! I can relate for sure! You made great use of your time being awake, wonderful! something done, as long as I’m awake! I love my caffeine, and love meeting people who enjoy it too! Surprisingly, I have noticed that it does not keep me awake, I will snore away even after consuming like 5-6 cups throughout the day or night! That might well be worth a try! The result could be a full nights sleep in spite of all the coffee! 0h i so enjoyed that i could almost smell the coffee and came in to join you. 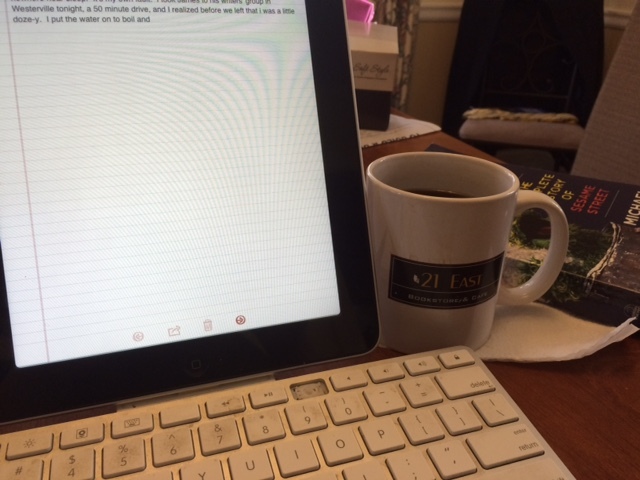 We need to have a bloggers’ coffee hour…an event I would love to attend! Thank you, Cathy! It will be a lovely day, when we share our thoughts and a couple of mugs of steaming brew!!! Hahaha! Guess what, I do, too! Maybe I should reconsider! Hehehe! I do enjoy a good strong cup from time to time! Bring it on! I came to the MacCaffine Clan in my 30s. But now I can’t function in the mornings without my *Cuppa Joe*. I do limit to 2 to 3 cups in the mornings and if I really need a cup, one before dinner. I have monthly meetings at Panera and am more caffeinated those days because I can’t refuse the free refills (using their very nice mug! )…..and I love their scones or muffins (I love the strawberry ones)……..and their tomato/mozzarella pannini……yum! Having a Cuppa with you one day would be very nice….perhaps at a Panera! I definitely endorse that plan! Sounds like we share very similar caffeine tastes… And taste in muffins and scones, too! Here’s my mug raised to you! Another wonderful post by Pam de Balzac! Thank you for it. To me, coffee is the best drink for writers–better by far than any kind of alcohol. Some writers have the ability to drink it while working. I cannot, but I drink it before a session or after one. I call it, “Getting to the cup”–a reward for completing the task at hand. I will drink nearly any kind of coffee set before me, but what I miss most about New Orleans since Katrina kicked me out was my daily cups of coffee with chicory–a kind of dark roast that, unfortunately, is becoming rare in coffee shops and restaurants around town. When I first moved there in 1992, I couldn’t stand the stuff, but after a year’s time, I couldn’t live without it. Because it was a dark roast, it had less caffeine than lighter brews, and I could drink it whenever I wanted–over a meal, grading papers, whenever. John, just after Katrina, the National Council of English Teachers convened in New Orleans…my first visit, and my intro to NOLA coffee at Cafe du Monde! I would go back tomorrow… I like the concept of ‘getting to the cup’…stealing that. Thank you for a wonderful accolade! You’re welcome. I’m very glad you enjoyed Cafe du Monde. The beignets are still good over there; the coffee’s gone downhill, lately. The brews you can get at the Palace Cafe or Mr. B’s over lunch or at Commander’s Palace at the end of a formal dinner have more character, and they’ll make coffee with chicory for you if you ask them to. Will store this info…would love to go back for a more relaxed exploration! That all sounds very familiar, Trina!!!! Yesterday we ran nearly an entire dishwasher of just mugs. It was not untypical. I love that!! Priorities proven!!! Wonderful post. Your story took me back to my own growing up days in a similar ‘Clan MacCaffeine’. I can still remember my first taste of the elixir, from a bite of a saturated doughnut, dunked in my grandmother’s morning cup, she had a hard time resisting my “sad puppy-dog eyes” she said. What a taste treat it was, I think I heard angels singing somewhere which was cut short by my mother’s voice telling me I needed to be older to have anymore coffee. Well, I got older, I got my coffee, and even after all these years, sometimes, over a really nice cup, I can still hear angels singing somewhere as I savor that first sip. Thank you for sharing such a lovely story. I hadn’t even thought about ‘dipping’–you’re right–first tastes… I heard the angels sing when I had my first French press coffee; I still hear them, too! Thanks for these wonderful thoughts…. Thanks for the memories. I grew up with the aroma of coffee brewing every morning. I think I inherited the caffeine-resistant gene. I can drink coffee late at night and it won’t affect me. My 85 year old mother still drinks over three cups of strong coffee at dinner and sleeps like a baby. A steaming cup of Earl Grey is a strong alternative for me!! Thanks, Sue! Pingback: Let Them Speak | blabberwockying! Our home culture is more of a tea culture than a coffee one! I feel I am on and off on tea too. In 2013-2014 I didn’t take caffeine at all for 11 months. I used to consume a lot of coffee when I used to work in an IT company. You are such a kind replier, Anand! Thank you for noticing! I thought I would change from drifting clouds to drifting leaves…and, I fear, it won’t be too long before snow flies in there! As usual, I enjoyed this post so much. I remember my parents having one of the glass coffee pots you put on the stove to percolate. I was always terrified I would break the glass innards of it (and did a few times) – that’s what they get for making me do the dishes from the time I could safely stand on a chair in front of the sink until I left for college. I so enjoy reading your writing. It’s like sitting with a good friend over a nice steaming cup of strong, black coffee. Cheers!! Cheers to you, my friend! (We were never allowed to have a glass coffee pot–a family of klutzes!) Thanks for your lovely words! Ah, what is it about a cup of coffee, or in my case, strong Yunan “gold”-tipped tea? There’s the aroma, the warmth, the taste, and the kick…easy to hold/cradle, and slowly sippable too. Not to mention so dependably easy to replicate cup after cup. Thanks for sharing your musings…I will send a silent toast to you during tomorrow morning’s ritual first cup! I’ll feel that shared moment tomorrow, Nancy! I do not know Yunan, “gold”-tipped tea–I have a bit of research to do in that regard. Cradling the cup–one of the best parts of sipping a hot brew. Thanks, Nancy! Pam are there actually people out there who don’t love the smell of brewing coffee?! And you are right it is so evocative of different memories. I don’t know those folks, if out there they be!!! And clearly, you DO speak coffee!!! Absolutely, Misti–and I think I sometimes miss those small and tender joys while looking around for the big, showy ones to burst into my life! It’s nice to take a moment and reflect…Thjanks so much for your thoughtful comment! Glad to know another devoted black coffee drinker! I’ll be the first to agree that there is NO scent like that of freshly-brewed coffee. I too remember coffee percolators, my grandmother’s used to go ‘blurp, blurp, bluuuuuurp” when the coffee was ready (also made with an eggshell). Yay for coffee, or, in my case, my blood supply. There was a spoof on Saturday Night Live where doctors secretly put Folgers into a very sick person’s IV…I always thought–Yep! That’s me!!! Thank you for this! Sipping my dark roast and smiling!!!! I just updated the reblog…giggle. (And I’m certain the dark roast smells wonderful!!) Hugs! Hugs right back to you!!! Pam, this was a delightful read. I love your friend Sharon who speaks coffee fluently and intimately! I hope you still like me when I admit to being a non-coffee kind of person. In fact, I see a lot of my friends on this string of comments. Hope I’m not a outcast! However, I gave away my non-coffee drinker status on a blog while back, didn’t I? (Coffee Interlude, Sept) I loved your history from the Clan. You did indeed! I married a non-coffee-drinker, so I realize lovely people appreciate all flavored (and levels of caffeine!) Thanks so much, Oneta!!! Very late to the party on this response, but I would love to try french press coffee. Someone told me I should switch to it, but I needed to make a quick decision on a coffee pot and didn’t have time to research. Loved this post! I will have to bring my press to work and we’ll have a professional discussion…driven by first-hand data!